Rather pretentious and overpriced for what it is, just my opinion. Renamed to the Lady Ottoline and totally refurbed. Not sure what it was like before, but a good bet now. The revamp has been sympathetic to the original interior, and it has an old time uncluttered feel while remaining intimate and cheery. Friendly bar staff, they came over before last orders to ask if we wanted anything else, and when we said yes served it and brought it over! Now that's service. And the gents must be the finest pub toilet in London. Beers were good, Mad Goose on I think, plus a couple of others. I could have quite happily settled in this pub for the whole afternoon and evening. But I had several other places I wanted to visit. It's relatively unassuming from the outside. But inside was quite welcoming. Only Greene King IPA and TT Landlord were on. Two guest beer handpumps had no beers. Westons Organic cider was available in bottles. Thai food is served until 9pm and the Thai cook/owner(?) was quite happily discussing Thai politics with fellow customers and was quite happy to throw the F word in occasionally! The windows of the pub are old Charringtons ones. There is also a Charrington mirror and a fireplace in the corner. A sign indicated a games room and function room upstairs. A TV in the corner was showing BBC News, whilst pop music was being played. There is also at least one fruit machine. 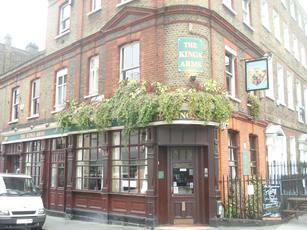 A fairly friendly and cosy local pub in the back streets of Clerkenwell. I thought that the barmaid in here was friendly and the ale selection of Greene King IPA, Pride, SA Gold and Landlord covers most people�s tastes. I opted for the Guinness which was on good form and there was also a selection of standard and premium products. I visited on a Monday night so nobody was tucking into the Thai menu, but there were some people upstairs utilising the two pool tables and two dartboards. There is some more seating in the front room upstairs and back down in the bar there is a plasma screen for the sports. I liked it in here but the toilet is tiny and there is no lock on the makeshift wooden board that is hinged to the cubicle. Maybe this has been sorted in the three weeks that have passed since my visit. This pub is a bit out of my way, but if I lived or worked closer I would revisit. Small nondescript corner pub in a quiet st near Grays Inn Rd. The interior of the pub is fairly spartan with wooden chairs and tables. There is not too much to recommend this place given nearby competition although there was a sign offering free pool on Monday nights which showed a touch of imagination. Ok for one if in the area but not somewhere to head for the evening.